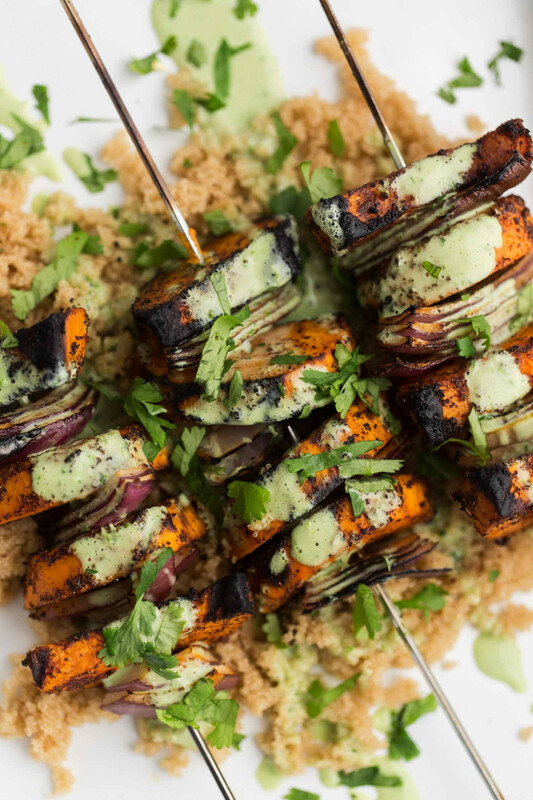 Spiced Sweet Potato Skewers with Cilantro Yogurt Sauce | Naturally. I will grill pretty much anything and grilled sweet potato has been one of my favorites throughout the years. The light char, the heavy sprinkle of spice, and creamy yogurt sauce makes it a satisfying grilled meal. This yogurt sauce is the perfect example- easy to whip up and can have a myriad of uses as a dressing for salad, grain bowls, and even enchiladas. 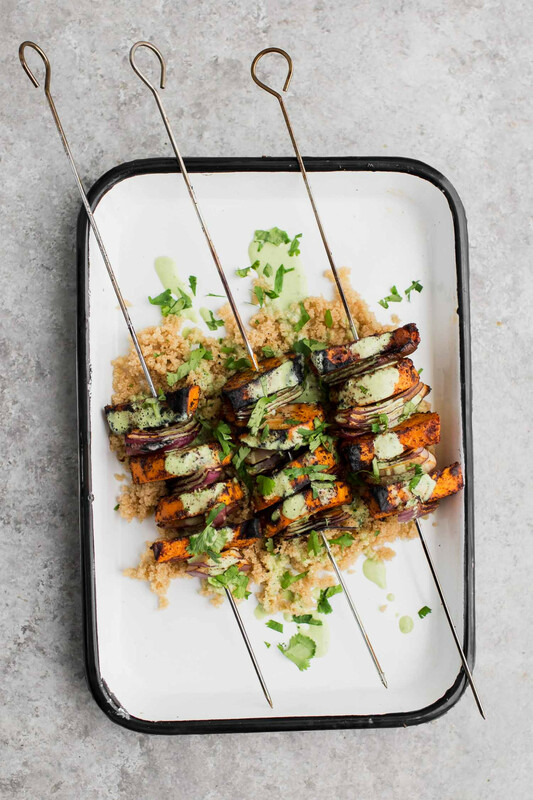 These spiced sweet potato skewers are a wonderful vegetarian grilling recipe that is made thanks to an easy cilantro yogurt sauce! Place a steaming basket in a large pot filled with ½” or so of water. Bring to a boil. Prep sweet potatoes: Peel, trim ends, and cut in half lengthwise. Cut each sweet potato half into ½” thick slices. Add the sweet potatoes to the steaming basket, cover, and cook until sweet potatoes are just-tender, 4 to 5 minutes. The skewer should easily pierce the sweet potato but not cause it to fall apart. Transfer the sweet potatoes to a bowl and toss with olive oil, spices, and salt. Let cool enough to handle. Light grill to medium heat. Cut onions into pieces similar in size to the sweet potatoes. Alternate sweet potatoes and onion slices on skewers. Place skewers on grill and cook, turning occasionally, until sweet potatoes have lightly charred on all sides, 8 to 10 minutes. 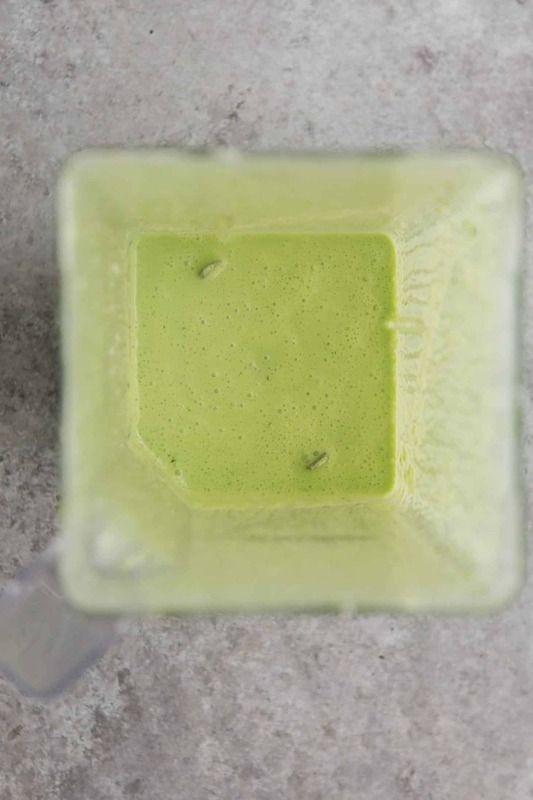 While the skewers are grilling, combine the ingredients for the dressing in a blender. Puree until smooth and there are no large pieces of cilantro. Serve skewers over grains with a solid drizzle of the dressing and extra cilantro if desired. Tips & Tricks: The key to these skewers is the consistency of the steamed sweet potatoes. 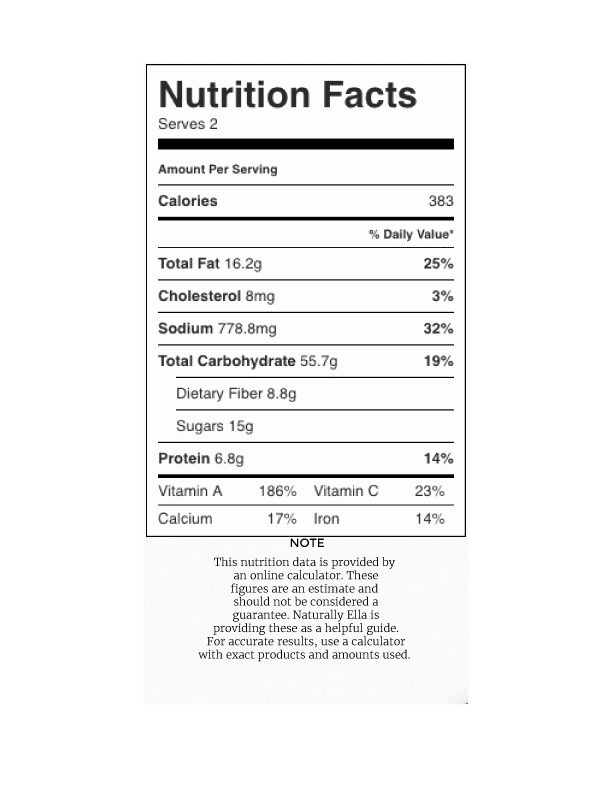 Nutrition: see the information (does not include grains). 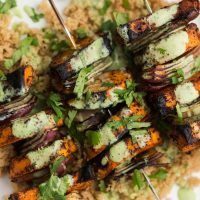 Spices: I like to mix up the spices on these sweet potato skewers. Chipotle powder, ras el hanout, jerk, or adobo seasoning would all work well. Vegetables: A lovely summer variation would be to swap the sweet potatoes for zucchini or other zucchini squash (which wouldn’t need to be steamed). Polenta: For an addition to these skewers, cooled polenta cut into cubes would be a lovely addition. Sauce: This sauce is more of a dressing consistency. If you’re looking for a thicker sauce, use Greek yogurt. You could also add avocado to the sauce.